One of the most recognisable structures on the Cam, Queens' College bridge was originally built in 1749 by James Essex the Younger. Since then it has been rebuilt twice to the original design of William Etheridge, once in 1866 and again in 1905. In 1866 the bridge deck was changed from a stepped design to the current sloped deck. In 1905 a complete rebuild of the bridge was required due to weathering of the original oak structure. Model of the bridge still possessed by clare college and assumed to be Etheridge' model of 1748. William Etheridge's design was based on work by James King on what has become known as tangent and radial trussing. Originally used to create the temporary formwork used in the construction of London Bridge, the arch describes an arc of a circle. The main members lie tangent to this circle and their arrangement is designed to ensure they are in compression only with very little bending moment. The connections between these main members transfer compressive stresses. The radial members are fixed normal to the circle of the arch and they support the top rail as well as making the bridge lattice into a more rigid structure. The bridge deck is then attached to the bottom of the radials near the intersection of two tangents. A bridge of a similar design was built my James Essex the Younger on the site of Garret Hostel Bridge, this was known as a 'mathematical bridge' and when it was reconstructed to a different design the name was likely transferred to Queens' college bridge. One of the most persistent myths on the river cam is that Queens' bridge was designed by Sir Isaac Newton and originally built without any kind of connection at the joints. Further stories have suggested that a group of students (or professors, depending on the storyteller) disassembled the bridge to discover how it stood up and then couldn't put it back together. 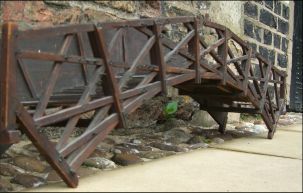 The bridge was supposedly then rebuilt using rather prominent bolts. In fact, the bridge was originally built 22 years after the great physicist's death and, although it has been rebuilt twice to the same design, there have always been fixings at the joints. However, the fixings on the original bridge were less visible than those on the current structure, possibly leading to the myth of the curious but inept students.